- Check in from 2pm and check out before 11.30am. - Reception closes from 12am to 8am. Customers are required to email us prior arrival if check in or check out during the above time for special arrangement. 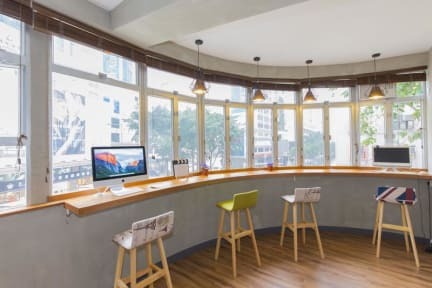 Check Inn HK is a new hostel here on Hostelworld, having opened at the start of 2012. They're already getting great reviews from our guests, who say it's 'run by people who genuinely care about what they do here' and has free water, free local calls, free Wi-Fi and comfy beds. It's located on Hong Kong Island near Wan Chai subway station, Hung Shing Temple, Pak Tai Temple, shopping centres, Central Plaza and more. We like their clean, colourful decor. Fantastic location, everything else was adequate. 하루전에 예약해서 터무니없는 가격에 예약을 하였다 난 분명 화장실이 포함되어있는 방을 예약했지만 호스텔 측에선 화장실이 포함되어있는 방은 없다고 하였다. 위치는 어디든 가기에 훌륭했고 화장실도 매우 깨끗했다. Nice enough hostel and I’d happily stay here again. Pros: The location is good on HK island. Rooms/facilities are clean and in good condition. Security door at front and there are small lockers in the room. Cons: Bed was a bit short and hard. Air con wasn’t particularly effective. Lockers not being big enough for more than small valuables. Staff weren’t particularly engaged. Very average, rooms were cramped, the hostel seems quite even on weekend. It lacks that fun atmosphere, and had a more of a hotel feel. Wasn't worth the price in my opinion. Our bathroom was disgusting bc the girls I was staying with were nasty but the workers didn’t clean it! Also I reserved a bunk in an all women’s dormitory but there was a man who slept there one night! Not acceptable!!!!!!! Great spot and super cheap for Hong Kong. Dorms were okay, the shower and toilet were all in one so a bit small and difficult. 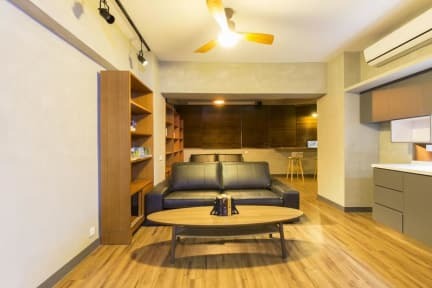 Would reccommend for anyone wanting cheap stay in HK. Pretty dull and weird vibe in the lounge and small, the private room’s bathroom was quite small and had the shower directly over the toilet and sink. It was cheap for a private room and in a good location, but I will probably stay elsewhere next time. I think what our guests really appreciate is that this is a family-run hostel. We treat our guests like friends and that's why we have such a high rating in terms of friendliness. We're always happy to go the extra mile to solve problems for our guests and we don't put a price tag on everything. Plus, our teams knows Hong Kong very well and can offer any kind of help to our guests.